Thinly slice the asparagus on the diagonal, slice the pepper, and divide between four jars. I've been feeling like a little bit more vinaigrette and my basic vinegar to oil ratio is 3:4, I eyeball three-quarters of a third cup vinegar and then actually measure a third cup olive oil—like in the 1/3 cup measuring cup, I use it twice— add a pinch of salt and some grinds of black pepper, whirr it all together in the small cup of the rocket blender, and divide the vinaigrette between the jars. Divide the breast and thigh meat of the chicken between the jars, saving the rest for snacks and soup. 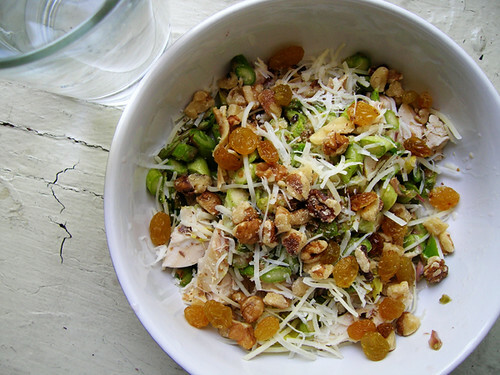 Empty your jar of chicken and fennel pepper vinaigrette on a plate, and top with golden raisins, walnuts, and parmesan. I pack raisins, walnuts, and parmesan for work in a little snack bag.